Mile Twelve, a bluegrass band based in Boston, will be featured in concert at the White Gull Inn in Fish Creek on Wednesday, May 1. Tickets for the 8 pm concert are $22. The Mile Twelve lineup offers five of the most promising young musicians in bluegrass: David Benedict (mandolin), Catherine “BB” Bowness (banjo), Bronwyn Keith-Hynes (fiddle), Evan Murphy (guitar, lead vocals), and Nate Sabat (bass, lead vocals). All are also accomplished songwriters. 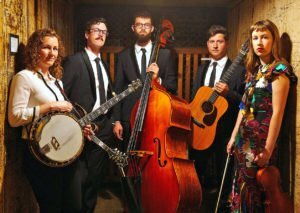 City on a Hillfollows multiple IBMA Momentum Awards, presented by the International Bluegrass Music Association to emerging bluegrass artists. Mile Twelve won the band category in 2017, shortly before releasing their debut album, Onwards. The following year, Keith-Hynes and Benedict secured IBMA Momentum Awards in instrumental categories, while the band earned two major IBMA Award nominations for Emerging Artist and Instrumental Performance of the Year in 2018. An optional pre-concert fixed price dinner will be served at 6 PM. Tickets and more information on the concert and the dinner can be obtained by calling the White Gull Inn at (920) 868-3517 or accessing the inn’s website, www.whitegullinn.com. If still available, concert tickets can be purchased at the door, although many concerts sell out, so advance ticket purchase and reservations for the pre-concert dinners are recommended.